Of the five standard opening points, the 5-4 point is the one which is farthest from the corner. Because of this, it does little to protect the corner. The compensation of course is that it is strong towards the center. By playing this way, Black seems to choose for himself a strategy directed towards the center - he will go for influence and large frameworks rather than for small but secure pieces of territory. The typical kakari to a 5-4 point is the 3-4 point inside it (a), which is also a possible enclosure point. However, as this is a low kakari (third line) it will give territory at the expense of centre influence. A second possibility is the invasion at the 3-3 point (b). As an opening play, the 4-5 point is more center-oriented than the 3-5 point, and less corner-oriented than the 4-4 point. Detailed variations may be found linked from 4-5 point josekis. 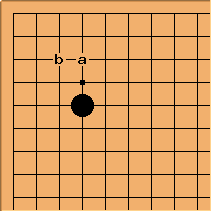 This opening play, popular in Edo period games and until the 1930s, has dropped out of fashion with most modern players. When compared with the 4-4 point it is less flexible.